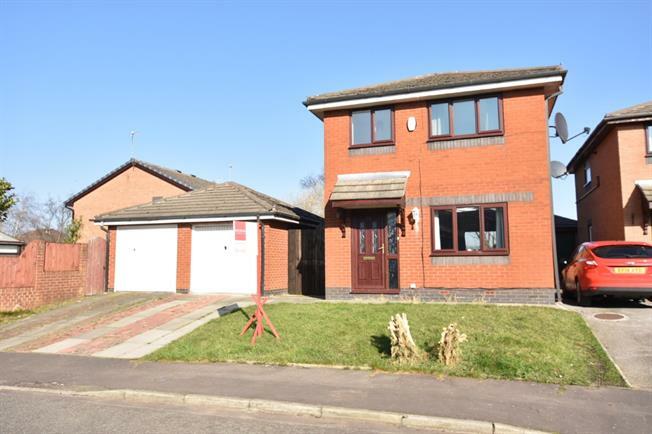 3 Bedroom Detached For Sale in Blackburn for Asking Price £130,000. The home comprises an entrance hall with stairs to first floor, reception room with feature fire and dining area with sliding patio doors to rear garden, with fitted kitchen with built in appliances. To the first floor are three bedrooms and a contemporary bathroom with three piece suite. Externally, the property benefits from a lawned garden to the front and rear with paved patio area and off street parking with a driveway and garage. UPVC double glazed front door. Radiator, laminate flooring, ceiling light. Double glazed uPVC window facing the front. Radiator and gas fire, laminate flooring, ceiling light. Sliding double glazed door, opening onto the garden. Radiator, laminate flooring, ceiling light. UPVC side double glazed door. Double glazed uPVC window facing the rear overlooking the garden. Radiator, vinyl flooring, under stair storage, tiled splashbacks, ceiling light. Double bedroom; double glazed uPVC window facing the front. Carpeted flooring, a built-in wardrobe, ceiling light. Double glazed uPVC window facing the rear. Heated towel rail, vinyl flooring, tiled walls, ceiling light. Standard WC, panelled bath, shower over bath, top-mounted sink. Loft access . Double glazed uPVC window facing the side. Carpeted flooring, ceiling light.